When I was in the Victoria & Albert museum I took this photograph of the 1960s cabinet. A nice range of clothes showing a variety of 1960s trends. Including some paper dresses – back row in turquoise/green and black and white op-art. 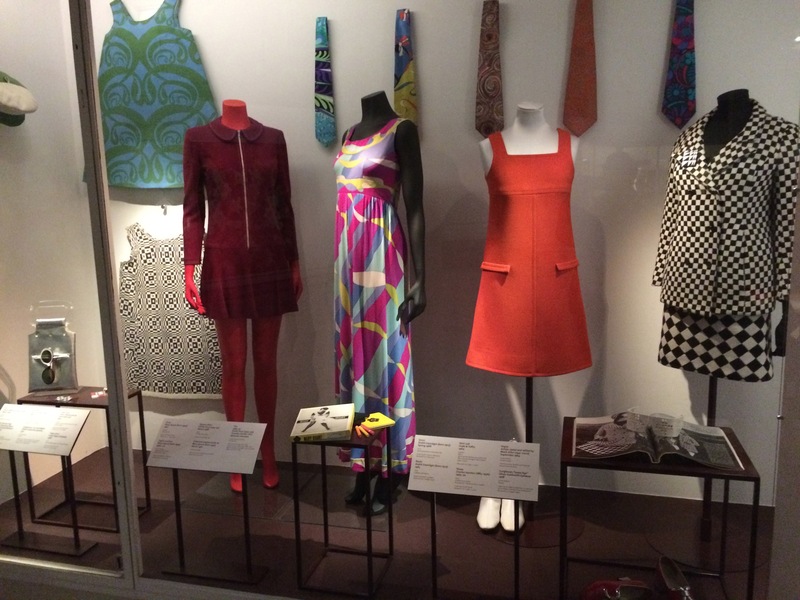 The lovely red dress in the foreground is by Courreges, and the suit on the right is by Foale & Tuffin. Recently I reviewed the decades of style by body shape. The 1960s, as you can see here, had a straight, boyish/childish ideal. I am not shaped like a boy, or a young girl. I have an hourglass type figure. Yet I love the sixties style. There is more to the sixties than looking like Twiggy. Let’s listen to Mrs Mole. I am very much in the same way of thinking (maybe it is our age, who knows?). I remember the 1960s. There was, as Mrs Mole notes, a change in the law on abortion and contraception, divorce and women’s employment rights. Class barriers began to be reduced and working class people could access a better education, jobs and other opportunities. The London scene – encompassing music, art, fashion and social behaviour – was incredibly seductive and successful. We felt technology and science could deliver real change – an end to hunger and disease. We got a man on the moon, saw JFK take over in the States and Harold Wilson in the UK. Martin Luther King made some headway in terms of anti-racism in the US and made his “I have a dream” speech. My own social housing organisation, Notting Hill Housing Trust, was formed in 1963. In 1968 student demonstrations in Paris were so threatening to the old order that Charles de Gaulle left the country, for a while anyway. Here’s some historical images, and a corresponding fashion shot for each year. I remember learning the Twist with my Aunty Beryl and cousin Clive. There was instruction on how to do it on the television. I can still do it now. And Chanel was seen as bit old-fashioned, but also very upmarket. My Mum had a Chanel suit, which she wore a lot. The image from 1962 is the Aldermaston march arriving in Hyde Park. I live very close to the Park and I like this image as it shows just how many people walked from the laboratory where they were researching the nuclear bomb to London. Lots of people I knew growing up were on that march, or claimed they were. It included Labour and Communist members, trade unionists, Christians and students. The other image is of a Valentino wedding dress from the same year. I saw it fairly recently at Somerset house. I liked that exhibition – mainly for the short films showing incredible craft skills in the workshop. I think of those films every time I cut bias strips. The explosion in the universities started to happen in the early 1960s, as young people from less privileged backgrounds began to access good quality further education. This photograph is from York. When I went to University in the late 1970s it was still basically free for people who couldn’t afford to pay, and heavily subsidised for those that could. In the 1960s students wore tweed jackets, fitted skirts and quite formal looks. The amazing Yves St Laurent hat just speaks to his original, innovative approach to designing – taking inspiration from peasants and nuns as well as from history, art and dance. Top of the Pops was launched at the start of 1964. On the first show there were: the Rolling Stones with “I Wanna Be Your Man”, Dusty Springfield with “I Only Want to Be with You”, the Dave Clark Five with “Glad All Over”, theHollies with “Stay”, the Swinging Blue Jeans with “Hippy Hippy Shake” and the Beatles with “I Want to Hold Your Hand”. Phew! The most electorally successful (alongside Tony Blair) leader Harold Wilson became the Prime Minister in 1964 giving the pipe, the Scilly Isles and the Gannex raincoat a much higher profile. What do you remember from the 1960s? I paid one dollar to a teen magazine for the name of a British pen pal which was all the rage after the Beatles landed in New York and appeared on the Ed Sullivan show. The best thing about that dollar investment is the fact thatswe wrote for over 30 years and finally got married 20 years ago…nothing is better than that except my mother finally let me get my ears pierced in 1964 and fashion was everything. Every older woman wanted to look like Jackie Kennedy or Twiggy for the teenagers. What a brilliant story about your dollar! A wonderful story Mrs Mole. Maybe the fact that you both express yourself so beautifully through the written word may have helped fan the romance. I had an American “pen-pal” or penfriend as we would say in the 1960s too. A girl named Rainey Belcher – who fabulous was that. Our letters were pretty boring – I was mainly interested in different words for the same things – penmanship and horseback riding for instance. And interesting that there were only two role models! Great comment. Thank you. Love your story, Mrs. Mole! What a marvelous dollar that turned out to be! Loved your sweet story, Mrs Mole. My memories of the 60’s in London are few which means I must have had a good time! Seriously though what I remember is the atmosphere which was electric as though anything was possible and we had no thought for tomorrow. The only other time I can say I felt such a good feeling was during the recent Olympics. Oh I’ve just remembered I travelled across London to a club called the Cromwellian in Earl’s Court to see a new group perform in a crowded dark hole of a place. It cost 7 shillings and 6pence to get in and the group was called The Rolling Stones. What lovely memories Linde – about the spirit of the age, and going to see the Stones! High school, college, tear gas at the Pentagon, lines of state troopers in big boots/helmets with plexiglass shields standing in front of the building where my Shakespere/Milton class was supposed to be meeting. Skirts that ended closer to bottom than knee, hair almost to my waist. Grateful Dead concerts. Clearly a busy time! Wow, we had almost similar 60s! Only mine were in the US. Great reflections, K. I was conceived in the summer of ’69, so what does a zygote remember? 🙂 I think I am a sixties wannabe. I was in high school in the mid sixties and wore home made sheath dresses and Capezio shoes. When I started college in 1968, I discovered that my wardrobe was really out of place and started buying my clothes at thrift stores. From there some of my favorite finds were Pendleton jackets and bell bottoms from the US Navy. What was on my feet? I don’t remember. Capezios! I begged my mother for a pair, all the “cool” girls had then in multiple colors. She gave in eventually, and I wore them so happily…..until I had to walk the uneven road home. Every little pebble was felt! But I finally had my prized capezios, so life was good. My memories of the sixties are all pretty sweet, with the exception of Vietnam. There seemed to be a general sense of unease, and I heard about it on TV and the radio quite a bit. I was a child in the 60’s, growing up in the same town as both of my grandparents and other family. My memories of that time are all fun, as a result. We moved away in ’69, and everything seemed to change after that. I love 60’s fashion, but I haven’t found much as an adult that looks great on me. I have vivd memories of many A-line dresses that my mom sewed for me in the 60’s. As a young mom, I made many of those same styles for my daughter. Cute, but carefree and easy to make! I was a teenager, I made a suit at school with bound buttonholes, hated it. Cotton conical bras, stockings with garters! Late sixties, riots in our city, peace demonstrations, the Grateful Dead, Jessica Mcclintock dresses, the Boston Strangler, Twiggy, sewing my prom dresses and everything else, boyfriend drafted and joined the Navy which kept him out of Nam, idolizing Jackie, summers on Cape Cod with the original totally preppy look, madras fabric, SO MUCH fun with our gang of friends that we are close with to this day. It was the best time of my life, great friends and great fun. I lived in a small town but still wore the mini (very mini!) and got shocked looks for it. I remember one girl was sent home from school because her skirt was too short – the next day, she turned up in a midi skirt – and was sent home for that too! My favourite times started in the 70s – I went to university in 1971. Fabulous story, Mrs Mole! Oh, my all these memories mirror my own! It was a turbulent decade, inspired my lifelong liberal leanings, and I still love those styles.